For the crust: Preheat oven to 350 degrees. Roll the pie dough out, if needed, into a 10-inch round on a lightly-floured surface. Ease the dough into the prepared pie pan. Fold the overhanging dough under itself and crimp the edges as desired. Chill for 30 minutes. Meanwhile, spread the pecans out on a temp-tations 13x9 Lid-it and bake until golden and toasted, 8 - 10 minutes. Let cool and separate 1/3 cup; coarsely chop the 1/3 cup pecans for garnish and set aside. Put the pie pan on a Lid-it and line the chilled pie crust with foil or a large coffee filter and fill with pie weights or dry beans. Bake until the edges are just barely golden, 15 - 18 minutes. Remove the foil with the weights, then brush the bottom and edges of the dough all over with the egg white and continue baking until the bottom of the crust is also just barely golden, 8 - 10 minutes more. Transfer to a rack and cool completely. For the Pecan Pie Filling: Scatter the remaining 1 cup of pecans in the bottom of the cooled pie shell. Whisk the corn syrup, brown sugar, butter, egg and 1/4 teaspoon salt together in a medium bowl. Pour the egg mixture over the pecans. Bake until just set, 20 - 25 minutes. Transfer the pie to a rack until cool to the touch. For the Apple Pie Filling: Peel, core and cut the apples into 1/4-inch slices. Place in a medium mixing bowl and toss with the sugar and lemon juice. Melt the butter in a large skillet over medium heat, then add the apples and cook, gently stirring occasionally, until the apples are soft but still hold their shape, about 10 minutes. Stir in the flour and cool completely. Pile the cooled apple mixture up and around the edge of the cooled pie (directly on top of the pecan filling) leaving about an 8-inch well in the center of the pie. Set aside. For the Pumpkin Pie Filling: Whisk together the pumpkin, heavy cream, sugar, egg and pumpkin pie spice in a medium bowl. Pour the filling into the center of the pie (directly on top of the pecan filling) with the apples as a border. Bake until the pumpkin center is set with just a slight jiggle, 50 - 60 minutes. If the crust gets too brown, cover with foil or a pie crust shield. Let the pie cool completely on a rack. 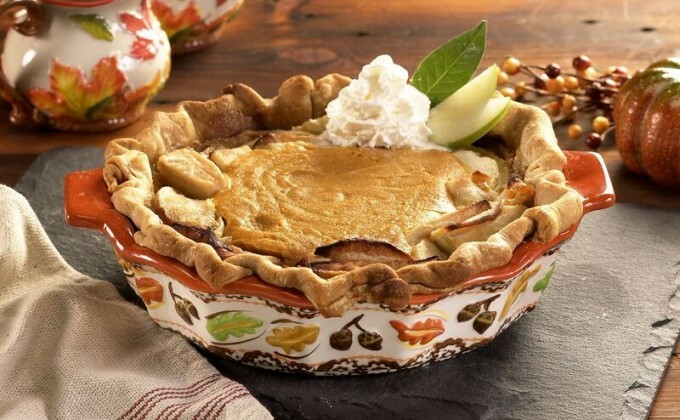 Sprinkle the reserved 1/3 cup chopped pecans around the pie, snug up against the apple filling. Slice and serve with whipped cream if desired.